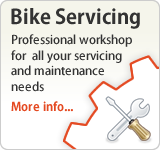 At Bike Scene, our fully qualified workshop offers a wide range of services. 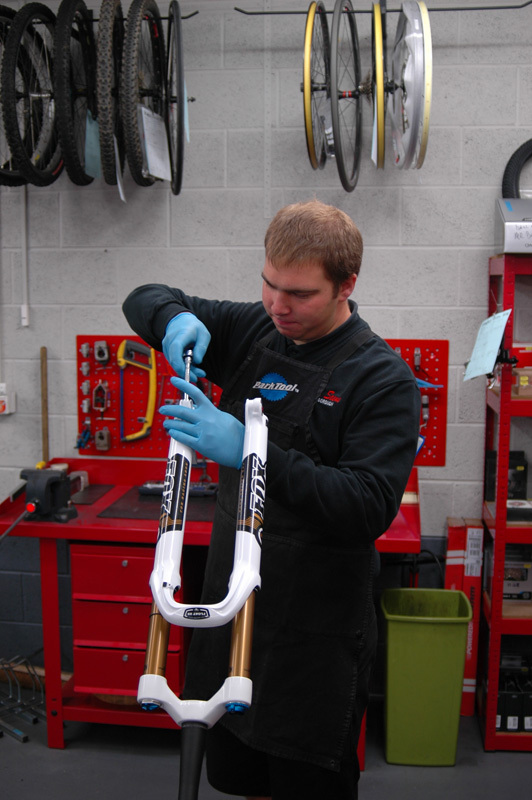 We take pride in making sure your bike is set up and prepared to the highest of standards. In 2004, two of our technicians were the first in the country to gain the Cytech NVQ Level 3 qualification - one of the highest industry recognised grades. We now have a total of three Cytech Level 3 qualified technicians and one qualified to level 2 and studying for level 3, with a total of 34 years of workshop experience between them! Furthermore, our technicians attend regular factory training sessions to keep up to date with the latest technology, specific to each manufacturer. 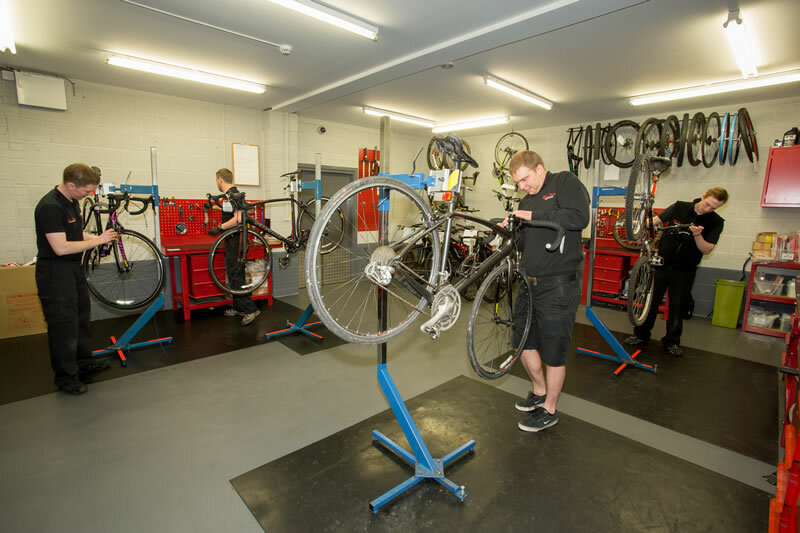 Our workshop offers anything from general servicing to more in-depth custom bike building, front and rear suspension tuning/servicing and wheel building. 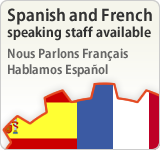 Here are some examples of the different kinds of services we offer. 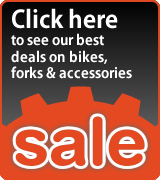 We offer several levels of servicing to suit your bike's needs. 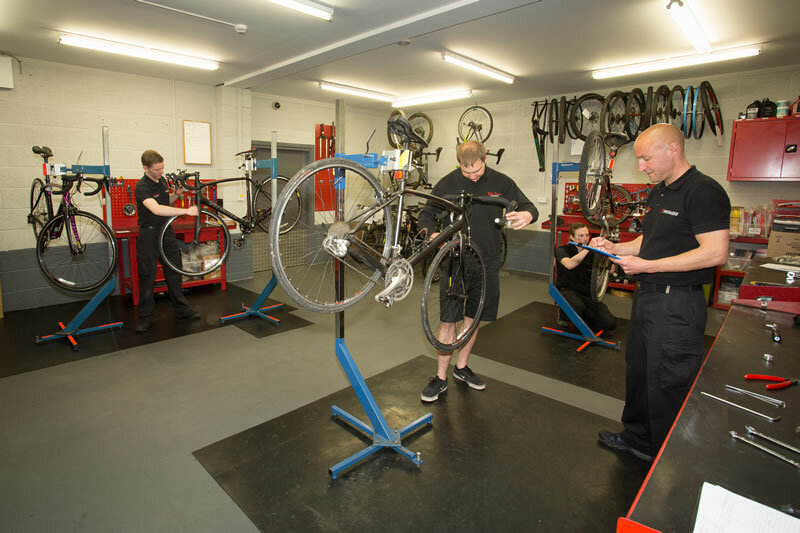 From a simple gear system set up, to a fully comprehensive cycle service including rebuilding hubs, headsets, suspension linkage pivots and suspension units. 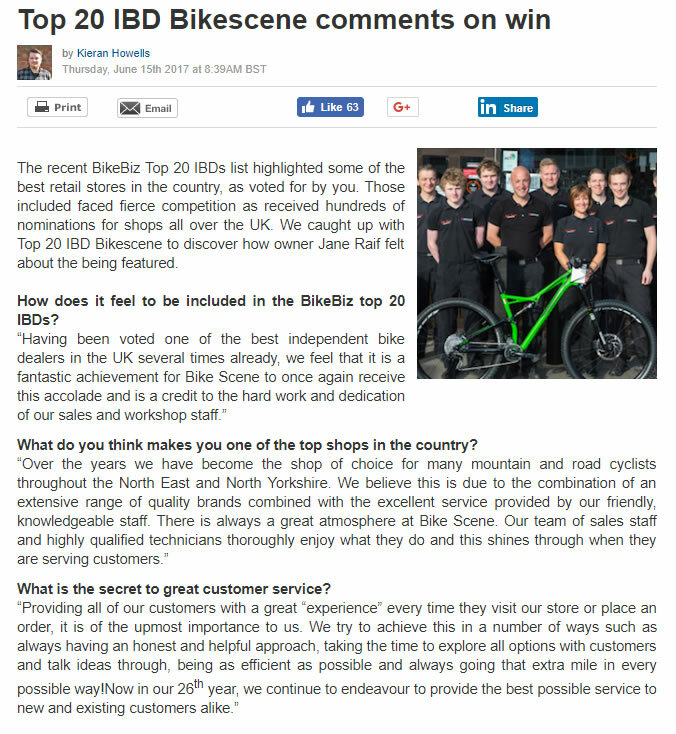 Every bike is different so our experienced staff can advise you on the best suited option. Today, more and more bikes are supplied with cable or hydraulic operated disc brakes. 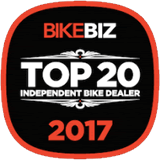 At Bike Scene, we are fully tooled to be able to resolve any issue you may have with your disc brakes. These services range from a simple set up and bleeding to a full system strip and service. Our workshop is also equipped with the latest frame and fork facing tools. These prepare your frame and fork so that the disc calliper sits perfectly perpendicular to the frame or fork. Bottom bracket facing tool: This faces the bottom bracket shell to make it perpendicular to the threads. This reduces the risk of premature wear to your bottom bracket. Bottom bracket thread tap: This chases, cleans and re-dresses damaged threads in the bottom bracket shell. Head tube facing and reaming tool: This faces the head tube to make it perpendicular to the reamed internal bore. Frame alignment: This tool measures the alignment of the frame. This is usually checked if the bike has been involved in an incident. Mech hanger alignment: This tool aligns the derailleur hanger to the wheel and frame to ensure perfect shifting. This is becoming more and more important with the introduction of 9 and 10 speed gear systems. 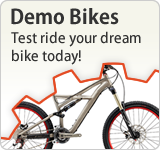 We possess a variety of bearing pulling and pressing tools specific to the model of your bike. We can complete linkage services, in which we strip, clean and rebuild your swing arm or carry out full linkage bearing replacements. Wheel building takes real skill. We boast many years experience in building all types of wheels from BMX wheels to super light weight MTB and road wheels. We keep a huge range of spokes in stock to suit whatever wheel style you require; whether it be an ultra strong dirt jump wheel or a super light weight MTB wheel. We can also tailor spoke tensions to suit your needs and accurately measure this with our spoke tensiometer. With the introduction of cartridge bearing hubs with serviceable freewheels, it is important to have the correct tools for the job. Again, we have invested in the latest tool sets to service and repair your hubs. These include Chris King, DT Swiss and Shimano. 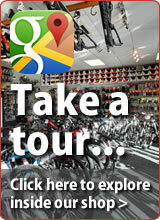 Bike Scene is an authorised service centre for Fox, Specialized, Pace, DT Swiss, Rock Shox and Marzocchi. We offer a number of suspension services ranging from minor services such as rear shock air can and fork user services to detailed diagnostics and full services, repairs and re builds. Our technicians have been professionally trained to offer you the best possible service. 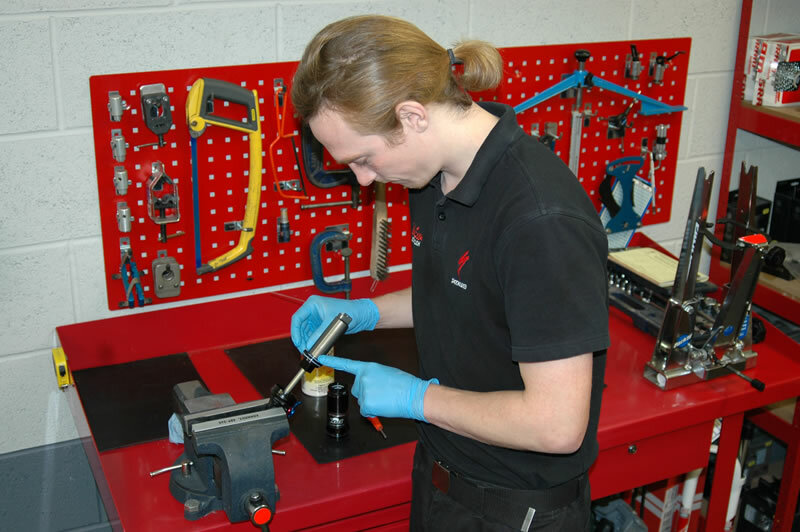 Where 'in house' servicing isn't possible, we can strip and despatch your suspension unit to the UK service centre and handle the process from start to finish. 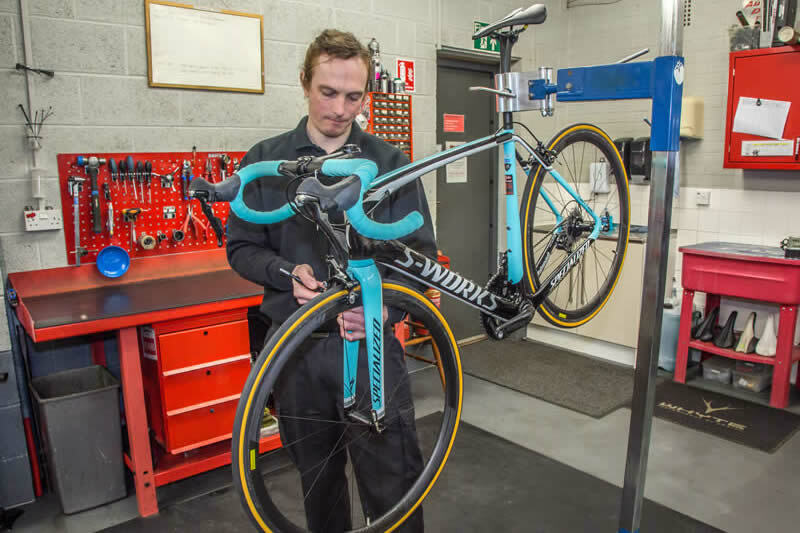 Once returned to us, the unit will be refitted to your cycle and all associated components checked and set up.